Monday (8:00-10:00) and wednesday (14:00 – 16:00). This subject is taught in Catalan. Monday and wednesday (16:00- 18:00). This subject is taught in English. The Expert Title will give a 6 ECTS credit recognition to those students who have taken the Environmental Law subject or a similar subject at another university. 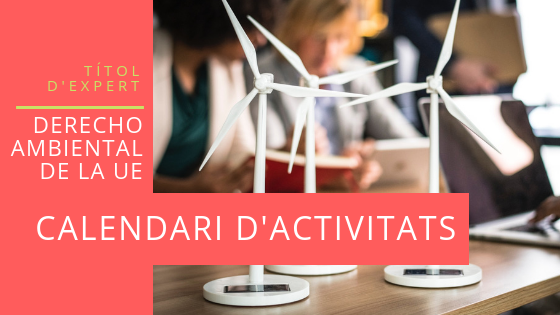 In the case you wish to ask for credit recognition, you shall present to the coordintation of the Expert Title before completing the online register, the following document: SOL·LICITUD D’ADAPTACIÓ D’ESTUDIS PREVIS A TÍTOLS PROPIS. 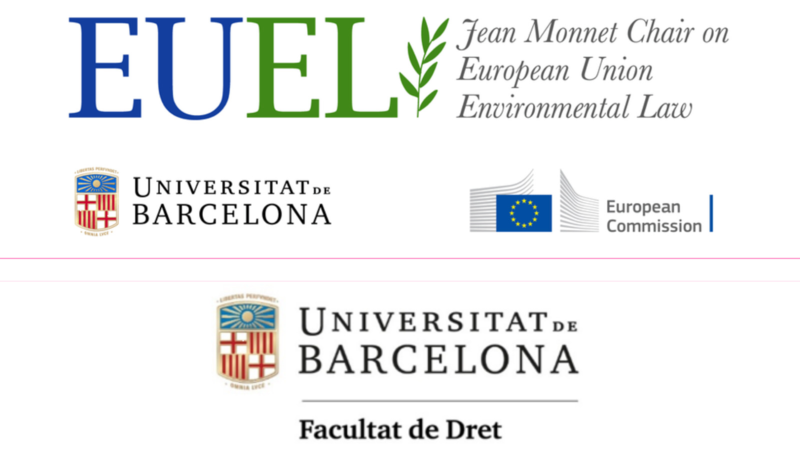 The Jean Monnet CHair on EU Environmantal Law (together with CEFJE and Clínica Jurídica Dret al Dret) organizes this seminari. It will be held on thursday the 7th, 14th, 21st and 28th of March 2019 (16:00-19:00). – Ilegal fishing, not declarated and unruled and the protection of the environment. It will be held on monday the 11th of March 2019 (16:00 a 18:00). – International cooperation regarding water (I). It will be held on tuesday the 7th of May 2019 (15:00 a 19:00). – International cooperation regarding water (II). It will be held on tuesday the 14th of May 2019 (15:00-19:00). c) Seminar on Legal Analisis focusing in EU Environmental Law. It will be held on wednesday the 24th of April 2019 (16:00-18:00), friday the 26th of April 2019 (15:30-18:30) and friday the 3rd of May 2019 (15:30-18:30). The seminars on Module 2 that refer to section a) and b) may be taken during the academic year in which the student is registered to the Expert Title or during the two previous years. The seminar of Module 2 in section c), however, must be taken during the year in which the student is developing the Expert Title. It consists on a thutorized Research work following the same guidelines as the regular TFG (“Final Degree Work”) of the Law Faculty of the Universitat de Barcelona. The Research work must consist on a topic related to the topics treated by the Jean Monnet Chair on EU Environmental Law and it will be thutorized by a teacher of the Jean Monnet Chair. The Research work must be submited before July the 22nd 2019.